Progressive jackpot machines are some of the most popular games to play at any casino. Walk into any land-based casino and you’re likely to see a bank of Wheel of Fortune machines in the back, beckoning players to enter. Progressive jackpot machines are very attractive to players because they offer the possibility of a massive payout. You don’t need to feed progressive jackpot machines like you do a regular machine for the chance to win big. You can join in anytime and have the same odds as any other player. Stand-alone progressive jackpot machines are not linked to other machines. These machines don’t have a fixed maximum jackpot. Instead, it uses a percentage of the total amount of coins played and combines that with the award resulting in the highest winning combination. Stand-alone progressive machines have a counter on the front of the game that displays the jackpot amount. The payout is usually equal to that of other machines, it’s just distributed in a different way to vary the top prize amount. 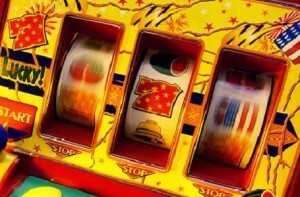 The total jackpot amounts for stand-alone machines are substantially lower than networked progressive jackpot machines. Proprietary progressive jackpot machines are uniquely themed and linked machines that are owned and operated by a particular gaming company. They can be exclusive to one casino or they may be available on a number of properties owned by the gaming company. While these machines might not offer the largest progressive jackpots, they can offer substantial winnings, sometimes in the millions. They also tend to hit more frequently than the widely-networked progressive machines. Networked progressive jackpot machines are the most popular because they feature life-altering jackpots. Instead of being owned and operated by a single gaming company, these machines are licensed by several gaming companies from a casino software provider. Each licensee’s customers contribute to the total jackpot amount. Some of the biggest progressive jackpot machine suppliers are Realtime Gaming and Cryptologic. Because there are so many casinos contributing their wagers, the total jackpot tends to grow rapidly and can easily add up to millions of dollars in potential winnings. Due to the cost of operating these machines the payout percentage for these types of progressives is substantially lower than the other kinds of slot machines. With million dollar jackpots hanging in the balance it’s no wonder why networked progressive jackpot machines are such a draw for players. However, it’s important to remember that the odds of winning these jackpots is very similar to that of winning a national lottery. It can definitely happen, but it’s rare. If you want a better chance of winning you might want to stick with proprietary or stand-along progressives. You could also divide your bankroll, allocating a set budget for high risk/reward games and leave the rest for more conservative play. This gives you more entertainment value because you’ll be able to play longer, but still has the thrill of chasing a mega-jackpot!